Just because it’s not white, grey or black, this T-shirt makes it into the unique t-shirt list! Please note: Sam only wears this shirt (from what I can tell), when he wants to co-ordinate with his Weird Red Flower Shirt (link to come). In Children Shouldn’t Play With Dead Things (2x04), Sam wears it underneath his Weird Red Flower Shirt when he and Dean are discussing possible ways to kill zombies before they head out to track down Angela Mason. He keeps it on through the ensuing action sequences and while reburying the corpse. 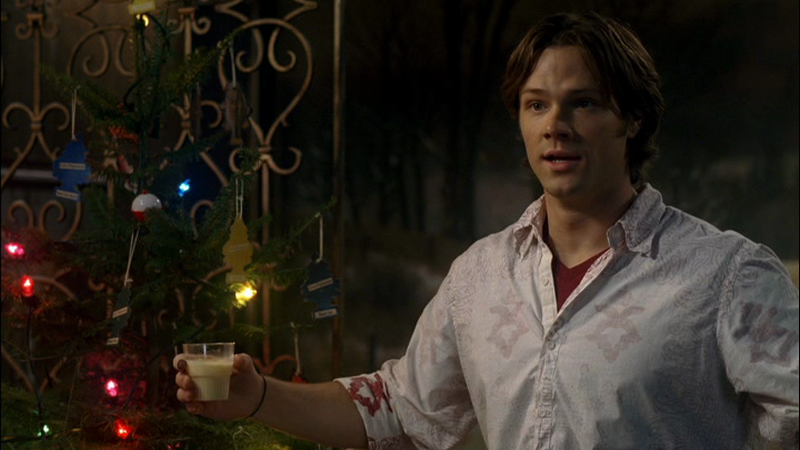 In Free To Be You And Me (5x03), Sam wears it when the other three Hunters first show up at the bar and try to persuade him to help them fight the demons.